What a fun race! I loved everything about it. This was the inaugural Big 10K and they did a fantastic job. You would never know it was an inaugural race. 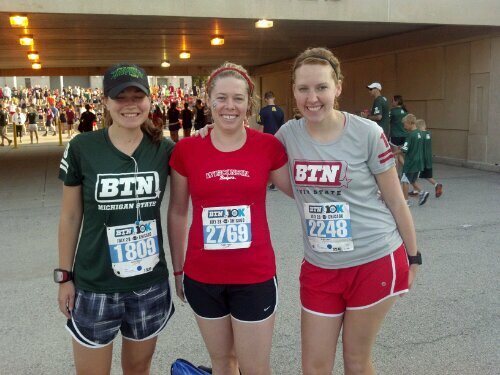 I ran it with two of my favorite race buddies, Mo and Kelsey. We prepared for the race by eating cheese fondue and burgers on the grill while watching the Olympic Opening Ceremony. The course was pretty simple. It was an out and back that started at Soldier Field and went south. Right before the turn-around there was an optional water slide. Mo is the only one of us who went on it. They also had one at the finish line. All along the course you could hear different Big Ten fight songs which was fun. At the finish line there was a big tailgate, which included tents from each school. I wandered over to the Wisconsin one as any good Badger alum would and found Heisman winner Ron Dayne. Yay! I had some fun with my bib. I have two of these now. I didn’t check my 10K times until much later and then realized this was PR for me. Mind you I haven’t raced a 10K since 2009 so I was very much hoping for a PR. When we finally have not 75+% humidity I expect to get a killer PR. All in all, this was a great race and I will for sure do it again. I must do this one in the future! Glad you had a good time, and congrats on the PR! Thanks. You would have love this. It made me want football season so bad.